Strathalbyn is a town in South Australia, in the Alexandrina Council. Get ready for a full day of sightseeing on the next day: contemplate the waterfront views at Laratinga Wetlands, then meet the residents at Monarto Zoo, and then pause for some photo ops at Strathalbyn War Memorial. To see traveler tips, other places to visit, more things to do, and more tourist information, refer to the Strathalbyn trip planner . Perth to Strathalbyn is an approximately 6-hour flight. You can also drive. The time zone changes from Australian Western Standard Time to Australian Central Standard Time (South Australia), which is usually a 1 hour difference. While traveling from Perth, expect little chillier days and about the same nights in Strathalbyn, ranging from highs of 34°C to lows of 19°C. Finish your sightseeing early on the 1st (Fri) to allow enough time to travel to Geraldton. Geraldton is a coastal city in the Mid West region of Western Australia, located 424km north of Perth.At June 2015 Geraldton had an estimated urban population of 39,825. 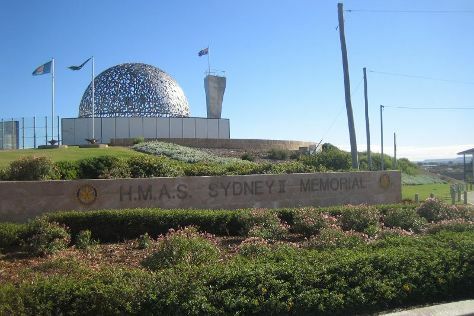 On the 2nd (Sat), take a tour of HMAS Sydney II Memorial, take an in-depth tour of Museum of Geraldton, then step off the mainland to explore Abrolhos Islands, and finally pause for some serene contemplation at St Francis Xavier Cathedral. On the next day, steep yourself in history at Oakabella Homestead, Tea Rooms and Campground, then examine the collection at The Tin Heads, and then stroll through Town Beach. To see where to stay, photos, ratings, and other tourist information, use the Geraldton online vacation builder . Explore your travel options from Strathalbyn to Geraldton with the Route module. The time zone difference when traveling from Strathalbyn to Geraldton is minus 1 hour. Traveling from Strathalbyn in February, expect nights in Geraldton to be about the same, around 22°C, while days are a bit warmer, around 38°C. Finish your sightseeing early on the 3rd (Sun) to allow enough time to travel back home.